The therapeutic method is based upon a system of medical-psychological Rehabilitation for the child. 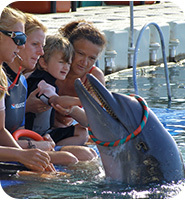 The physical contact of the child with the dolphin in the water is most important as it promotes the mental and physical development of the handicapped child. When necessary, or on request, the parents may participate. Additionally there are several different methods of therapeutic treatment that take place in the REHA Praxis carried out by therapists according to the patient’s requirements. Further therapeutic treatments are: Talassotherapy, Kinesotherapy, Psychotherapy with the communicative aspect and Ultrasonic therapy (using the natural sonic waves of the dolphins). 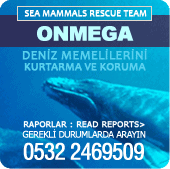 The Russian specialists call the following a ,Therapeutic Metaphor’: One should imagine the dolphin as a ,needle’ that can pass through all pathological and mental barriers of a child, pulling with it a ,thread’, the ,thread’ being other types of therapeutic treatment that are now enabled to work effectively. Dolphin Therapy modifies and corrects patterns of behaviour; this motivates the patient and leads to a great improvement of cognition. This effect has brought it to be one of the most successful methods used in complex rehabilitation. Dolphin Therapy acts as a strong catalyst which enables other forms of classic therapeutic treatment undertaken in our DT-REHA-Center to work effectively. One of the methods the Russian specialists use is the “Reward method”. When the patient has mastered the task set by the therapist, the patient is rewarded with a swim with the dolphin. This is a variant of the therapy where the doctor plays on the vanity of the child. Autistic children, but also some children with other ailments, are strongly introverted and can register their environment only in part, or not at all, so a catalyst is required; this is where the dolphins play their part. The Russian doctors use a therapy based on close contact with the dolphin. The child, the doctor, the dolphin and the trainer all together in the water provides the ideal basis for close contact.